It can be hard not being, well, constantly enraged at the world lately. There’s news like Eliza Dushku reporting the harassment she suffered on the set of CBS’ Bull (and she’s far from the only one), the brutality of people being murdered in the caravan, the migrant camps — including Holocaust-style registration numbers — and, well, I probably don’t need to go on. It’s a frustrating time. But at least, there’s a nice breather from being upset. Though it’s basically an advertisement, NBC’s A Very Terry Christmas: Get Cozy With Terry Crews is a welcome, calming respite. People have been comparing A Very Terry Christmas to Bob Ross, which makes sense. 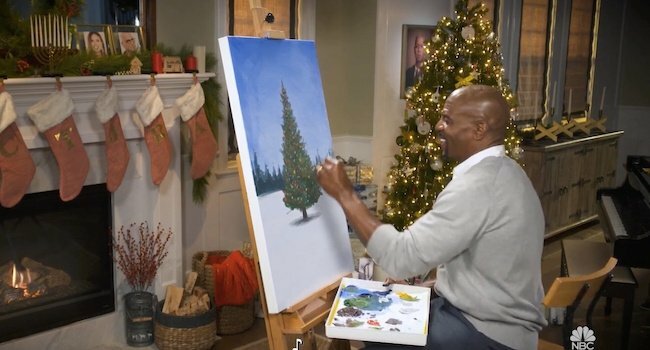 The show is very simple; Terry Crews, not just a NFL star, actor and all-around mensch, but also a talented artist and designer sits in front of a yule log and paints a Christmas tree in a forest clearing. Crews quietly speaks to the viewer and explains what he’s doing. Whether or not you paint, it’s utterly soothing and educational. In fact, as a non-artist, it’s almost magical watching the painting take shape over just 43 minutes. A Very Terry Christmas is a perfect example of Nice TV. I’ve previously praised The Great British Bake-Off, another exemplar of the form. (The American counterpart is also worth watching, even though with the US-length ad breaks, the show moves far too quickly.) And, of course, Mister Rogers’ Neighborhood could be said to have pioneered the format. Obviously, not everything on TV should be Nice TV; I love my horror, pitch-black comedy, biting satire and the rest. (After all, I just reviewed The Shivering Truth, which is as far as you can get from “Nice TV.”) But we definitely need Nice TV, too. It’s nice to see people be kind, quiet, considerate and friendly. Even if the purpose of A Very Terry Christmas is to get you to watch Brooklyn Nine-Nine, it doesn’t matter if you’re a B99 die-hard or if you’ve never seen the show. Terry Crews is lovely. He invites you in and shares his immense gifts with you. He’s a fantastically talented artist, but above that, he’s encouraging. He gives good advice, he’s funny and, well, he’s just nice to hang out with. I’ve never met him in real life, but the Terry Crews in A Very Terry Christmas feels genuine. It’s nice to have 43 minutes to just breathe. 43 minutes of calm. I’m not sure if there’s anything Terry Crews can’t do. I didn’t expect the list of Crews’ abilities to include “Be the next Bob Ross,” but he excels at it. While I realize A Very Terry Christmas is an ad, and a (successful) attempt to go viral, it also shows his talent for reaching out to people. If Crews wants to, I’d watch him paint every week. I can think of very little I’d like more. I doubt he’s reading this, but on the off chance: Mr. Crews, thank you. Thank you for making a lovely program. We need more programs like this. We need more people like you. Thank you.